NOTE: this development had some regressions temporarily and removed from LibreOffice 4.2.5 (except the hard hyphen related fix) on 2014-05-29, but later it was fixed for LibreOffice 4.3 (2014-07-30). Hyphenation is for better text layout. Ironically, LibreOffice’s hyphenation sometimes did the opposite. It seems, changing to ICU’s line breaking algorithm and allowing words with hyphen characters in spell checking have resulted a double regression in the hyphenation of OpenOffice.org. I believed, that the first problem (often missing hyphenation of words with ending punctuation) is only related to the Graphite layout, see my old bug report with typesetting examples: https://sourceforge.net/p/silgraphite/bugs/37/. 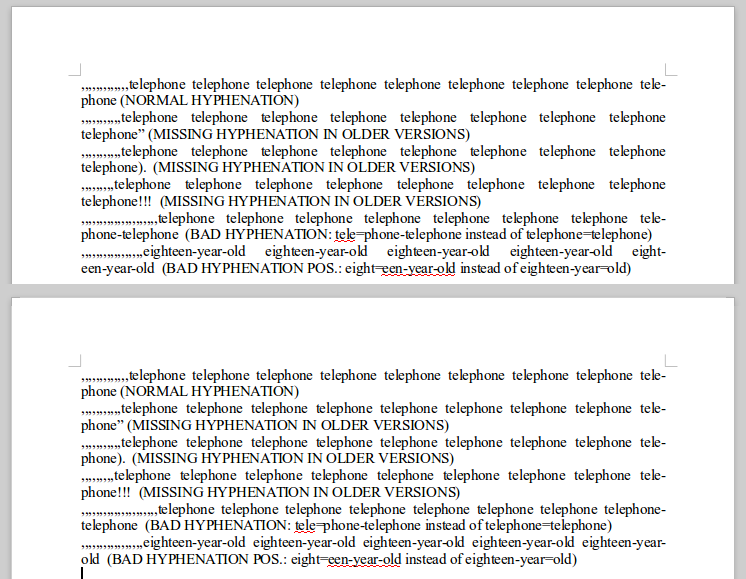 I recognized and fixed the last problem (competing libhyphen and ICU based line breaking) in LibreOffice a few years ago on a very tricky way (hyphen replacement by the hyphenator), but not so later I had to remove this patch to fix a new problem raised in the French hyphenation (https://bugs.freedesktop.org/show_bug.cgi?id=43931 Unwanted behaviors due to Hyphen 2.8.3 (French hyphenation)). A few weeks ago I began to fix these problems, and now at the LibreOffice conference hackathon I have successfully solved them. The associated bug (https://bugs.freedesktop.org/show_bug.cgi?id=56392) contain the test document of the following screenshots (before-after). Many thanks to bug reporter “stfhell”, bug tracker contributors, LibreOffice conference and hackathon organizers and the sponsor of the conference hackathon, CloudOn. Előző Korábbi bejegyzés: Idén is vár a Linux az Oktatásban és Szabad Szoftver Konferencia!